A year or so back, I launched a newsletter for entrepreneurs called the EntrepreneurshipDaily. It was a service where I curated a bunch of interesting articles and stories for aspiring entrepreneurs. Also, as the name suggests, it was something that I sent out daily. But a couple of weeks after I launched, I noticed that the rate of growth of new subscribers was way lower than the rate at which people unsubscribed. After a bit of research I realized that sending out a curated list every day not only lowered the quality of the newsletter content but also quickly drowned the enthusiasm among my subscribers. I decided to change my strategy and send one email every week rather than bombard my subscribers every day. And it worked. I was not only able to deliver higher content quality but the approach also helped in maintaining a subscriber rate that was higher than the rate of unsubscribers. Unfortunately, the once-a-week formula isn't for everyone. For instance, take Tammy Tivis, the owner of Element Bath and Body, a wholesale seller of soap supplies. In the beginning, Tivis says her company used to send three to four newsletters a month. Anticipating subscriber fatigue, they reduced the frequency to one per month. This was however met with disappointment as the company realized that their subscriber-based preferred a more constant touch with their supplier. But for Daniel Tilipman, the president and co-founder of National Debt Relief, a debt consolidation company, their strategy to send promotional emails every second or third day did not go too well with the recipients. The company lost nearly 15 percent of its list before they realized their emailing frequency was too high. According to Tilipman, the company now sends out one special offers mailer every 14 days or so. “As we reduced and realized that each email has to pack value, we started seeing better results,” he says. The moral of the story is that every business and industry has a sweet spot that gets you the maximum engagement at an optimal email frequency. 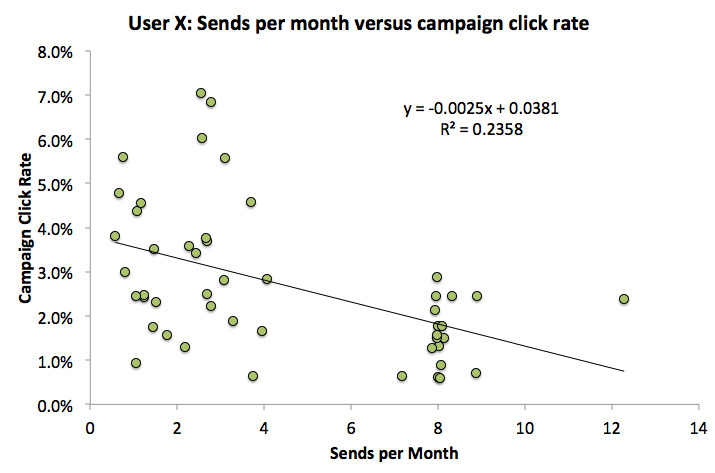 For instance, for my business in the graph above, the ideal frequency is around three emails per month mark. This amount provides the optimal click-through rate yet there is no corresponding drop due to an increase in frequency. How do you arrive at such a sweet spot for your business? 1. Identify what frequency rates you want to test. To begin with, identify the various possible frequency rates you want to test. For instance, if you have a hunch that four emails per month is the ideal frequency for your audience, you could pick three different frequency rates like three, four and five times per month to test. You should ideally be testing three or four different frequencies. The next step is to create an equal number of email segments to test against. Ideally, you should have at least 500 subscribers in each group. But if you have a smaller audience, ensure that no segment goes below the 300 mark. If your list of subscribers is smaller, then it probably is not the right time to test frequencies. You should be working on increasing your subscribers first. 3. Set up email newsletter with different frequencies. Once you have your test frequencies and their corresponding segments ready, it is time to set up the email newsletter for each of this segment. One important point to note: ensure the subject lines, content, send-out time and other variables are all consistent across the various segments. This is very important since the engagement rate is impacted by all these factors. The only variable that should be different is the email frequency. Once a batch of 10 to 20 emails have been sent out across all the different segments, measure the results. Personally, I ignore the open rates and only test the click-through rate and opt-outs. In my opinion, these two metrics are the most defining aspects of email marketing. Rank the segments in the order of engagement. Now you have the ideal email frequency for your newsletter. You may either choose to go with this or continue your test by replacing the worst performing segment with a new test segment. Continue these tests till you find the email frequency that is the most popular among your audience. Email frequency is an extremely vital piece in the newsletter puzzle – send too often and you are likely to annoy recipients and will have a high unsubscribe rate; send too infrequently and you may lose touch with the subscribers and potential revenue. The only way to survive is to keep testing until you arrive at the sweet spot that is unique for your business and audience.